As featured recently in a Pursuit piece, we are making steady progress with the genetic rescue of eastern barred bandicoots through our joint work with Mt Rothwell sanctuary. Genetic rescue provides a way of introducing new genetic material into threatened populations which in turn allows these populations to increase their fitness and ability to adapt to expected (and unexpected) environmental changes. 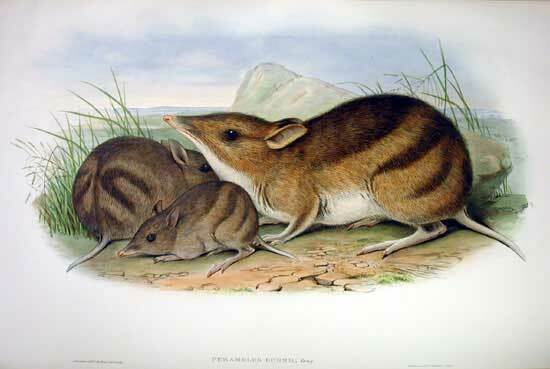 These bandicoots were abundant in Victoria before European settlement but their habitat became highly restricted with the expansion of agriculture. Introduced predators and competitors further reduced their population size. Eventually the bandicoots became restricted to a handful of protected areas, where fences protected them against predators. But as only small populations were maintained in these areas the bandicoots have lost genetic variation. This in turn leads to a loss of adaptive capacity, and the expression of undesirable traits due to inbreeding. Both these processes can eventually contribute to the extinction of the remaining populations. To counter this loss of genetic variability bandicoots have now been introduced from Tasmanian populations of the same species – even though these populations have been separated for thousands of years. Unlike their Victorian counterparts, the Tasmanian populations retain robust genetic diversity as eastern barred bandicoots remain abundant in the wild in Tasmania. For the genetic rescue to be successful, Tasmanian populations have to be able to cross to Victorian population in order to produce F1 offspring and F2 offspring, which then provides the genetic material required to reinvigorate the Victorian population. This aim has now been successfully achieved with the first F2 individuals being produced in pens and enclosures at Mt Rothwell with the help of the local crew there headed by Annette Rypalski and masters student Ruth Healy-McFarlane. With a reinvigorated population, the bandicoots should be ready for release into wider areas in the future, helping to secure the local persistence of this species. Masters student John Black will be pursuing this genetic introgression over the next 12 months. Editor’s note: See below video on the crowd-funding campaign to support this project go.unimelb.edu.au/8jw6.